We’ve known since the Hampton Reunion that this was an experience that we wanted to create for and offer to Phish fans, and players have had a great time so far. 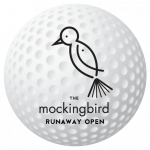 So, we finally got around to starting an annual outing: The Mockingbird Runaway Open. The first golf tournament exclusively for Phish fans was held 10/30/16 at Arroyo Golf Club in Las Vegas, with 18 players; the second was 9/2/17 at Buffalo Run in Denver, with 36; and the third was 9/1/18, at Applewood Golf Course in Denver, with 54. We look forward to seeing you on the links for the fourth, details TBA soon! The Foundation has benefitted from two poker tournaments – the Phamily Poker Classic – held in Atlantic City, NJ, and Tahoe, NV. We look forward to holding a third someday, perhaps in Vegas – it just hasn’t quite happened yet. Over the years, these several dozen artists, and their patron collectors, have developed quite a community, with an eager market of discerning tastes and growing collections. We are proud to work with these folks, on art exhibitions and other Foundation projects, and look forward to doing more with them in the future. The vibrant online community at Phish.net has been holding pre-show meetups since 1993, if not earlier. They’re typically at a nearby bar or restaurant, have frequently passed a hat or raffle for the Foundation, and a great place to meet like-minded folk (whether online acquaintances or not) face-to-face.